Japanese ryokan meals are nothing to snub. Japanese inns basically have two meals, dinner and breakfast. This is the traditional style of a Japanese inn, and a chef specializing in a ryokan cooks a cuisine devoted to “local production for local consumption” using local ingredients as much as possible, such as vegetables, fish, meat, etc, to entertain guests. Many inns at Kinosaki Onsen offer kaiseki (a Japanese style banquet) for dinner and set Japanese meals for breakfast. Taking full advantage of the seaside location, meals tend to have a plentiful menu of marine products such as matsuba-gani (snow crab) in winter. Also, items grown in the area’s rich soil like fruits and vegetables as well as Tajima beef (a delicious and high quality beef) can be enjoyed at each ryokan. 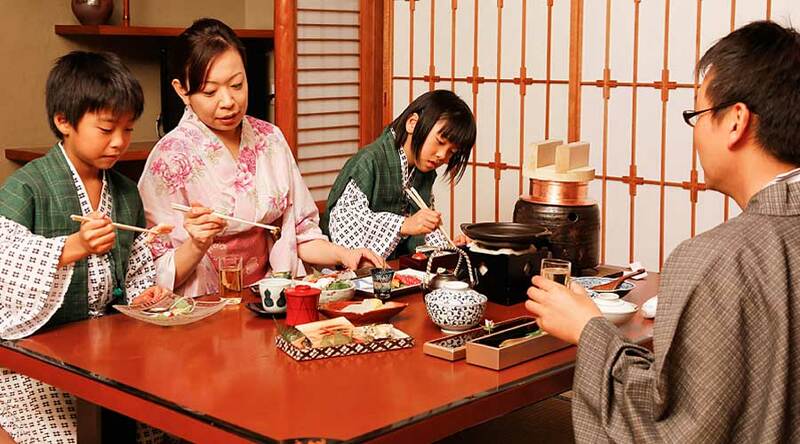 By the way, a lot of Japanese visitors choose a ryokan based on their meals. Main – Mix of cooked meat, fish, vegetables, etc. Besides the above, a nabe (hot pot) or mushi-mono (steamed dish) may also be added. Also, staff will bring out the next dish based on when you will finish the previous dish. It is standard practice to finish each plate individually. In the cases where the meal is served in the room we will bring everything to your room, and if you are in a dining room staff will bring the dishes to you. The flavor of the meal is to be enjoyed of course, but the charm of Japanese cuisine is also the visual appeal of its presentation. 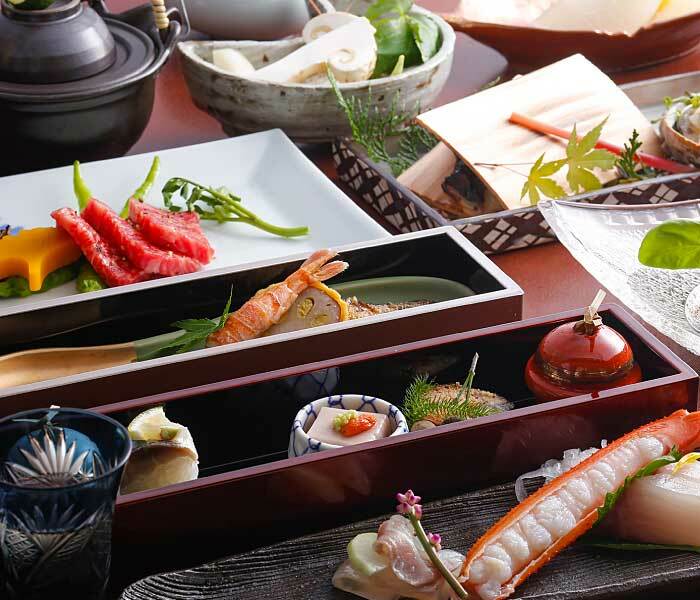 One thing that Japanese cuisine honors is the “seasonal feeling”. The current season determines what patterns and ingredients will be used in the dishes. Seasonal flowers and leaves and decoratively cut vegetables are used as finishing touches on each dish making them look like beautiful paintings. In additional to cherishing the seasons, you can also enjoy the three feelings of the seasons known as “hashiri”, “shun”, and “nagori”. “Hashiri” or “running” is the anticipation of seasons like getting the first Katsuo (bonito) of the spring and summer. “Nagori” or “end” is being able to enjoy the fish right up until the season ends and it is no longer available. The more you know the deeper Japanese cuisine becomes, but in the case of ryokan you do not have to worry about manners or such because meals are generally served in the privacy of your room. So do not worry about proper dining manners, rather focus on enjoying each dish instead. For a ryokan breakfast, on the other hand, all of the dishes are served together at once. Oh yeah, that’s another thing about Japan’s countryside–“to serve a lot of dishes” is the best type of hospitality. Therefore, both dinners and breakfasts come with a lot of food so you better come hungry. To make room for breakfast, it is best to hop around to several of the bathhouses and get yourself moving after dinner. For breakfast, the standard menu includes miso soup with freshly cooked rice, grilled fish with rolled egg omelets, nori, vegetables, pickled vegetables, and more. Even if dinner was served in your meal, at most ryokan it is common for breakfast to be served in the dining hall. During this time staff will enter your room and put away your futon beds. For those who wish to laze around after breakfast, remember to tell staff so that they don’t put yours away. 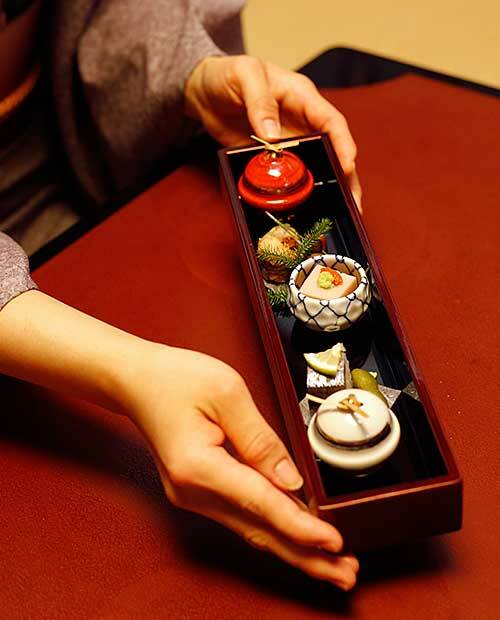 Recently the number of ryokan that offer lodging without included meals is increasing. I have heard people say “It is expensive when meals are included.” But from my viewpoint I think that the prices are extremely advantageous for two meals. Because if you were to eat the same dishes and same amount of food out at a restaurant, it would be very pricey. If you compare that price combined with the price for one night accommodations at a ryokan to the price of a stay that includes two meals, the latter one would be cheaper. Of course, going to a restaurant and choosing your favorite dishes to try is also part of the fun during your trip. However, since you have traveled all this way to Japan please give this traditional meal a try, it is a great way to experience the pride of Japan’s food culture and a tradition of the ryokan. Although it has become less common recently, having dinner in your room can be said to be the real pleasure of staying at a ryokan. Depending on the chef, everything begins with the selection of ingredients, each dish is carefully and skillfully prepared and arranged. Please feel free to ask questions about any of the dishes if you don’t know what they are. Take your time to enjoy the specialty of the meal. Or rather, laugh and have fun with it a little. I hope I can express to you how special my town is. A town that I feel is one of a kind, a miracle onsen town, and is beautifully suited for yukata.